This week’s challenge was to Draw or collage something that begins with the first letter of your first name. This is what I created using B.
I look forward sharing The Documented Life project 2015 with you! This week’s DLP challenge was “Document your family holiday traditions”. With the holiday in full swing, family in town and life’s regular demands, I didn’t have a whole lot of art time this week so I decided to keep it simple. I started by dry brushing on a base of light blue of acrylic, then airbrushing a darker blue over snowflake stencils using my Copic airbrush system. To add a bit more layering, I stamped on a bit of Christmas letter text and added some silver metal leaf around the edges. Next, I painted a snowman couple and dressed them up with caps and scarves that I cut using my Silhouette Portrait, making sure to give my snow woman girl pink, rosy cheeks. To complete my layout, I added some of our holiday traditions to hearts, cut them out and ran them through my Xyron to adhere them to the page. Lastly, I added a bit of journaling around my snowmen for added visual interest. Thank you for looking. It’s been a pleasure sharing my DLP layouts with you for the last 6 months and I look forward to sharing 2015 with you as well. “Arrows” was this week’s DLP challenge and I had such fun creating these pages. It was a wonderful opportunity to document feelings of love and gratitude for my Beloved and all that he has brought into my life. Getting to play with the fun arrow stamps that I purchased from Paperbag Studios wasn’t bad either! They can be found HERE and HERE. To begin, I brushed on a base of fuchsia, blue and lime green acrylics, then a light layer of diluted gesso over it, to soften the transition between colors a bit. Not too much, you know how I love my vibrant colors! Once that was dry, I misted on a bit of Dylusions Ink Spray in Bubblegum Pink over the Dina Wakley “Plastic Canvas” stencil. Something I’d like to point out here is that unless you seal your Dylusion inks really well, they’ll activate with other wet mediums. When using them in mixed media, you’ll want to give some thought as to what mediums you’ll be layering over them. To give my background a little more texture I used a silicone pot holder and black StazOn ink to stamp the pot holder’s honeycomb pattern onto my pages. I stamped the arrows onto some book pages, cut them out and ran them through my Xyron. I know that I’ve said it before, but I LOVE my Xyron and highly recommend it. It comes in so handy for art journaling. Next, I stamped one of the faces from Dina Wakley’s “Face The Crowd” set onto a book page and painted her using gelatos and white paint. For her body, I hand cut a gelli plate print that I had in my stash and stenciled a design over it with an older stencil that I have in my collection, modifying it a bit to add in a few arrows. I don’t recall who makes it, but I believe that bought it at my local art supply store a couple of years ago. I added the sentiment using some Tiny Text stickers by Cosmo Cricket. Although I haven’t been using the tip in as much, this week I decided to add in a fun Week In Review card just to document a bit about what’s been going on in our lives…. Life is good ♥. Thanks for looking… I wish you a colorful week! This week, our weekly Documented Life Project challenge was to pick a fantasy vacation spot and create a packing list. Since I was fortunate enough to have had my main dream vacation fulfilled a few years ago, spending 3 weeks in Italy, with side trips to Germany, Austria & Switzerland, Spain is now at the top of my list. 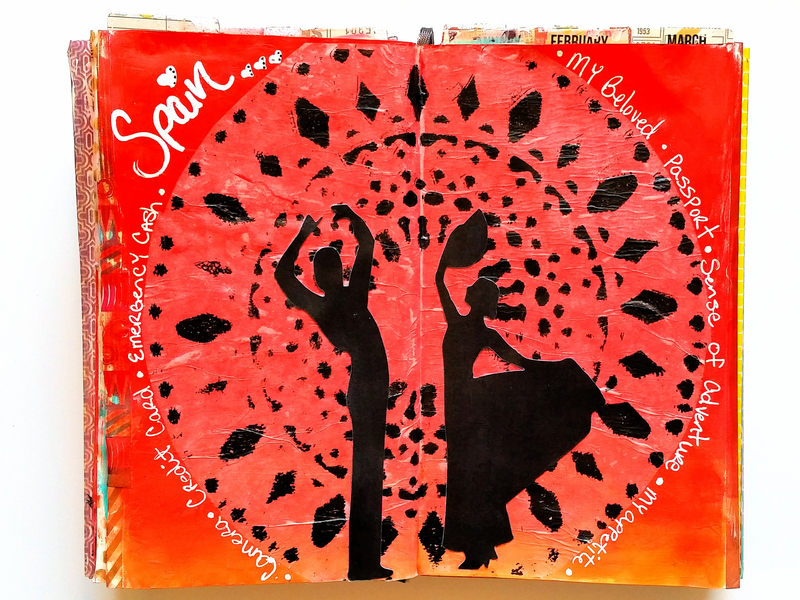 I wanted to keep this layout simple so to create the base I rolled Dina Wakley media acrylics in Ruby and Tangerine onto my gelli plate to get an ombre effect and pressed my journal, face down, onto it. I then pulled a print using the Lace Doily stencil by Kaisercraft onto deli paper and cut out the Spanish couple using my Silhouette Portrait. A little fluid medium adhered everything to my journal and I added my packing list around the edges of the circle.